DHTMLX Optimus is a micro framework for building DHTMLX-based apps. The framework enforces consistent application structure by breaking a monolithic application into a set of reusable classes. As a result, each part of an app can be developed and tested independently and used in various combinations. Each module describes a part of UI (a single view). You can use normal DHTMLX code inside of the module to initialize a single component. Top level modules can combine multiple views into a layout and so on. The app itself can be used as a view in some other application. The framework provides a common event bus to allow communication between views and some other helpers for common DHTMLX tasks. Pay attention to the "package.json" file in the root of your app's project. The main fields is important, it is the primary entry point to your program. This should be the name of the app's module. codebase/ folder - includes static files used in the application (images, icons, styles, data files, etc.). The content of this folder is added by the build. By default, index.html includes a free version of DHTMLX from our CDN. If you are using DHTMLX PRO, place the DHTMLX files into the "codebase" folder and adjust links in the index.html. The view's configuration is similar to that of an application. A new view class is inherited from the DHXView class. The render() method is used to draw a view. In the above example we have set a view with a grid inside and specified some config properties for it. You can create any number of views by this means and use all of them in your application. We recommend to have a single view per file and name file the same as the view, e.g. GridView => views/grid.js. As you can see, we can use the show() API to render some other view inside of a layout's cell. The above code shows different views in the cell "b", based on the selected row in the grid. You can see that the code uses addSlot() API to set a name for the cell with dynamic content. In the above snippet we have used grid.ui.attachEvent() to register an event handler for the element in the child view. This is a bad practice, since we get a tightly coupled resulting code which can be easily broken. There is a better approach - the usage of the global event bus. After attaching an event in one view, you can call it in another one. Let's consider an example. We have a dataview called "Countries" in the countries.js file and a grid named "Cities" in cities.js. We want the grid to display cities related to the country selected in the dataview. Here on selecting some item, the code calls the onCountrySelect event, which can be caught in any other view. When a country is selected in the dataview, the _setCities() method is called and data in the grid is refreshed. So the two views are now connected. Event handlers will be automatically detached on view destruction. 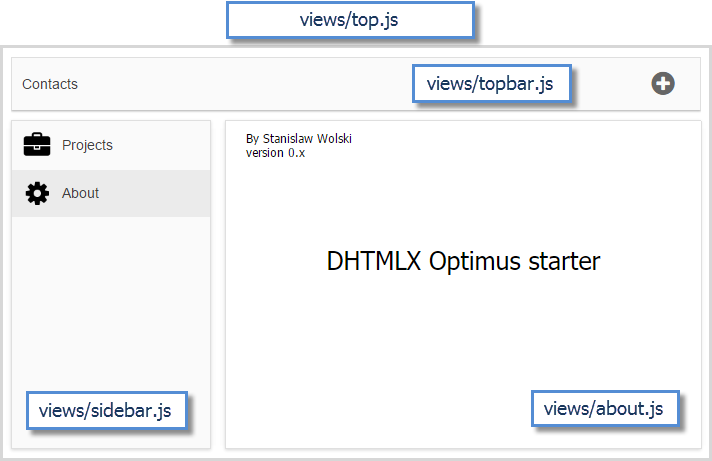 DHTMLX Optimus automatically destroys a view, when a different view is shown in the same slot. addSlot() allows adding a slot (named area) into a cell. The content of the slot can be changed/removed without affecting the rest of the cell's area. For example, we have a layout with 2 cells. We want to dynamically change the content of the cell "a". Firstly, we use the addSlot() method to add a slot named "details" into the cell "a". // adding a slot called "details" into the cell "a"
Then, the show() method is used to render desired views in the added slot. It takes the name of the view that will be displayed in the slot and the name of the slot as parameters. While the slot content is re-rendered, the GridView view in the "details" slot is destroyed and replaced with DataGridView, while the rest content of the cell "a" will remain the same. The main UI, the reference to which is stored in this.ui will be destroyed automatically, you don't need to use a custom code to clear it. Windows File Explorer-like application using DHTMLX library. The above code imports an HTML template and attaches it to the root cell. During rendering the code sends a hash of parameters which will be placed inside of the template. You can use normal DHTMLX API to load data into any component. We recommend to store Toolbar, Form and Menu configuration as a part of the view file, and load external data only for data components such as Grid, Tree, TreeGrid, DataView and Chart. Instructs all calls to the "server" folder to be routed to some other server. localURL defines the full web URL of the backend server. DHTMLX Optimus allows creating multi-language applications. Localization is implemented on the base of the Polyglot.js library. Later in any view you can use this.app.locale to access text translations. Locales are stored in separate JS files in the locales folder. It will set the necessary language and take translation phrases from helpers/langs.js. DHTMLX Optimus provides an easy way to use Dependency Injection container. The app and all views have addService() and getService() API which can be used to define some shared module. It can be used to share the state of components without directly exposing them. If a view which has registered some module is destroyed, all registered services are deleted as well. For some components it's necessary to specify the path to the folder with images. In order not to set the full path each time, the framework provides a useful helper. You can apply the helper inside of the regular setImagePath() method of the main UI, like this: this.app.imagepath("componentName"). It will create a "dist" folder with all necessary files. Just push those files on the production server. After that you can call npm run deploy to synchronize the dist folder to the target server (path to the target server is configured inside of gulpfile.js). With DHTMLX Optimus, you can combine several applications and make them work as modules of one large application. The API is the same as for working with views, just use the this.show command. You can use different applications or create multiple instances of a single app.